Place the chicken in a pan with the water and bring to a boil then simmer for 10 minutes. Pour half the strawberries along with the orange juice, olive oil, chilies and lemon zest into a mixer. Add black pepper and blend until smooth. Transfer into a saucepan and boil, and then simmer for 5 minutes. Remove the chicken and let cool. 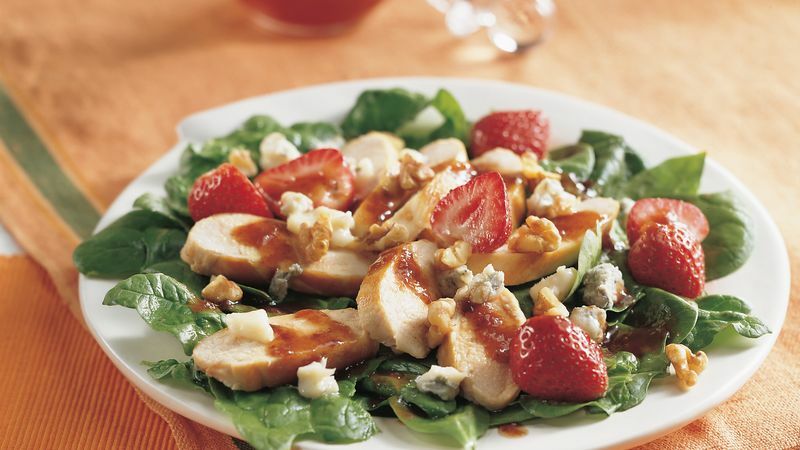 Place into a bowl with the salad mix and toss together with the strawberries. Sprinkle over the warm dressing and top up with walnuts.